Info Jacob "Jack" J. Lew (born August 29, 1955 in New York, New York) was Director of the United States Office of Management and Budget (or OMB) from 1998 to 2001 and a principal architect of fiscal policy under the administration of President Bill Clinton. Lew graduated from Harvard College in 1978 and the Georgetown University Law Center in 1983. Lew began his career in Washington in 1973 as a legislative aide. From 1979 to 1987 he was a principal domestic policy advisor to House Speaker Tip O'Neill, where he served at the House Democratic Steering and Policy Committee as Assistant Director and then Executive Director. There he was responsible for domestic and economic issues including Social Security, Medicare, budget, tax, trade, appropriations, and energy issues. Lew left the White House in October 1994 to work as OMB's Executive Associate Director and Associate Director for Legislative Affairs. 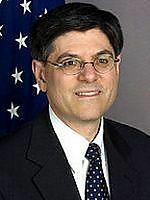 From August 1995 until July 1998, Lew served as Deputy Director of OMB. There, Lew was chief operating officer responsible for day-to-day management of a staff of 500. He had crosscutting responsibilities to coordinate Clinton Administration efforts on budget and appropriations matters. He frequently served as a member of the Administration negotiating team, including the Balanced Budget Act of 1997, developing a reputation as a patient and effective negotiator. President Clinton nominated Lew to be Director of the OMB, and the United States Senate confirmed him for that job on July 31, 1998. He served in that capacity until the end of the Clinton Administration in January 2001. As OMB Director, Lew had the lead responsibility for the Clinton Administration’s policies on budget, management, and appropriations issues. As a member of the Cabinet and senior member of the economic team, he advised the President on a broad range of domestic and international policies. He represented the Administration in budget negotiations with Congress and served as a member of the National Security Council. Immediately after the Clinton Administration, Lew was a Visiting Research Professor at the Georgetown University Public Policy Institute. Lew then served as the Executive Vice President for Operations at New York University until June 2006. He was also a Clinical Professor of Public Administration at NYU's Wagner School of Public Service. In June 2006, Lew was named Chief Operating Officer of Citigroup's Alternative Investments unit. Lew co-chairs the Advisory Board for City Year New York. He is a member of the Council on Foreign Relations, the Brookings Institution Hamilton Project Advisory Board, and the National Academy of Social Insurance. Lew is also a member of the bar in Massachusetts and the District of Columbia.